About 60 kilometers (37 miles) north of Mumbai in Maharashtra, the nostalgic ruins of Vasai Fort tell the tale of what was the headquarters of prosperous Portuguese rule in the 16th and 17th centuries. More than just a fort, Vasai Fort was once a living city that was, astonishingly, of greater size and importance than Mumbai (Bombay). Vasai, called Baçaim by the Portuguese (and later renamed Bajipur by the Marathas and Bassien by the British), came into Portuguese possession after it was surrendered by Sultan Bahadur Shah of Gujarat in 1534. Mumbai, which was merely a group of islands inhabited by villages of indigenous koli fishermen, was also handed over to the Portuguese at the time. The Portuguese used Vasai as their commercial and military base. It became their capital in the north Konkan region and their second most important location after Goa. They strengthened and developed the preexisting fort structure, naming it the Fortaleza de São Sebastião de Baçaim (the Fort of Saint Sebastian of Vasai). Inside were the glorious mansions of Portuguese noblemen, seven churches, convents, temples, hospitals, colleges, and administrative centers. The Portuguese governor also used the fort as his official residence when he visited the area. The sprawling fort, with its indomitable stone wall and 11 bastions, covers nearly 110 acres. It has a very strategic position surrounded by sea on three sides. The Portuguese were renowned for their naval power and fiercely guarded it with a fleet of armed ships, making it impenetrable. Apparently, the Marathas tried for two years to capture Vasai Fort during Portuguese rule but couldn't gain access. Their attacks only made minor dents, some of which can be seen, on the fort's wall. In they end, they managed to weaken the Portuguese by cutting off their food and trade supplies after conquering Arnala Fort to the north of Vasai. Upon finally winning the war, the Marathas took possession of Vasai on May 12, 1739. It was a momentous occasion that severely diminished Portuguese influence and restricted their reign of the coastal region to Goa, Daman and Diu. If the King of Portugal hadn't already given the Mumbai islands away to the British as part of a marriage dowry in 1661, the outcome (for Mumbai and the Portuguese) could've been very different! The fort's refinement and splendor has gone, its overgrown ruins are used as a backdrop for selfies and Bollywood movies, and children play cricket on the expanse inside its citadel. Yet, a little imagination and a good guide will magically bring the past stories and sagas of Vasai Fort to life. As you explore it, you'll be transported back to a defining period in India's history and the location of the spirited battle between the Portuguese, Marathas, and British. These days, the fort falls under the auspices of the Archaeological Survey of India as a national protected monument. However, sadly, little money or effort has been put towards maintaining and conserving it. One person who has taken an interest in fort is Vasai local Leroy D'Mello, who runs Amaze Tours. He aims to showcase the fort's heritage, while promoting the history and culture of Vasai. I spent a couple of hours exploring Vasai Fort with him as part of his insightful Cultural and Heritage Tour of Vasai. We were accompanied by three very knowledgeable gentlemen who provided an outstanding narrative of the fort, including many little-known facts. They were local collector of old coins and archaeologist Mr. Pascal Roque Lopes, architect Mr. C. B. Gavankar, and Mr. Vijay Pereira who has been studying the Vasai war for a decade. 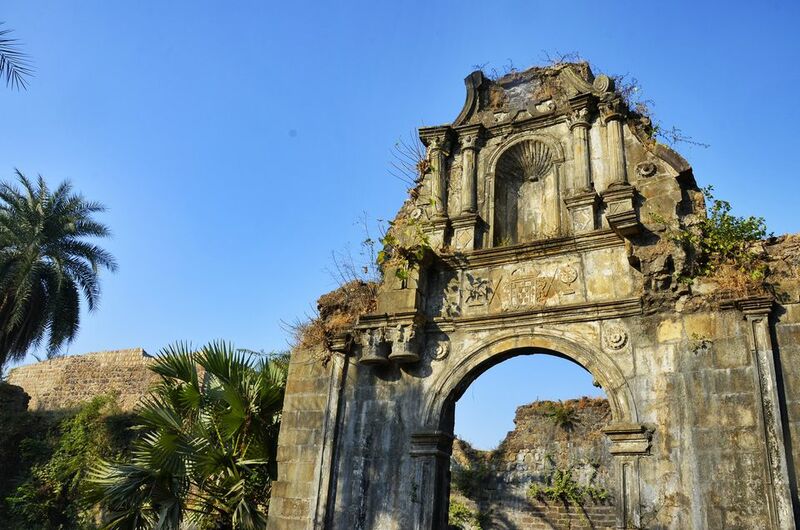 Among the most prominent remnants in Vasai Fort are three churches -- the Holy Name of Jesus Church (also known as the Jesuit Church), Saint Joseph's Church, and the Franciscan Church of Saint Anthony. If you've seen the churches of Old Goa, it's likely that the remains of the Holy Name of Jesus Church will look familiar to you. Its facade strikingly blends the architecture of two renowned Jesuit churches there, the churches of Saint Paul and Bom Jesus. It's one of the most noteworthy examples of Catholic architecture in India. The Church's construction took place over many years from 1549. According to reports, this wealthy church had three altars that were, along with the triumphal arch, lined with gold! Nowadays, it's the only church in the fort that continues to be used for worship. The annual Feast of Saint Gonsalo Garcia (the first Indian to saint, who was born a Vasai village) is still held there. Saint Joseph's Church was the tallest church in Vasai Fort. It was founded in 1546 but renovated and enlarged in 1601. The winding narrow steps inside its towering remains can be climbed for a magnificent view across the coast. Another highlight of Saint Joseph's Church can be found in the dome of its baptistery at the front part of the church. Look up and you'll see traces of Portuguese-period paintings of floral motives, and the faces of angels in the background. The Portuguese Franciscans built this imposing church in memory of Saint Anthony, who passed away in 1231. The church dates back to 1557. What's particularly remarkable about it are the tombstones that line its floor. There are about 250 of them, with inscriptions indicating that they belong to Portuguese nobles. Climb the ramparts from the courtyard inside the fort's western Land Gate (Porta Da Terra), and you'll reach a flat platform bearing a stark flagpole. It's here that the Marathas unfurled their flag after finally capturing the fort in 1739. The heavily bombarded Land Gate has a sophisticated design with double entrance, which was a common Portuguese defense mechanism. The door of its outer gate was studded with iron spikes to prevent elephants from charging into it. If the enemy did manage to enter the gate, they had to pass through a confusing courtyard and narrow passage to reach the inner gate. The passage, which was open from above, cleverly enabled soldiers on the ramparts to attack the enemy while they were trapped in it. Vasai is cutoff from Mumbai by Vasai Creek (which is one of the main distributary channels of the Ulhas River in Maharashtra). Currently, the only bridge across it is a rail bridge. Hence, Vasai is best reached via the Mumbai local train. Take a Virar-bound train, originating from Churchgate on the Western line, to Vasai Road railway station. (Avoid peak times, as this is a notoriously crowded train!). From the station, take a bus or auto rickshaw to the fort. It's about 20 minutes away. If driving from Mumbai, the only option is the Western Express Highway (National Highway 8), which is a much longer route. The fort is free to enter. Unfortunately, the Archaeological Survey of India hasn't put up any signs, so there's no information about the monuments in the fort. This makes it invaluable to have a good guide if you're keen to learn about the fort and its history. Vasai Fort is covered as part of this full-day Cultural and Heritage Tour of Vasai offered by local guide Leroy D'Mello of Amaze Tours. Local travel company Swadesee also conducts group tours of Vasai Fort, led by Mr. Pascal Roque Lopes. Contact them for upcoming dates. Do be aware that there are no tourist facilities such as food or water inside the fort. See Photos of Vasai Fort on Facebook. Read More About My Tour of Vasai.